ACTION ALERT: Tell Canada to Protect Polar Bears! PLEASE SIGN ! Though experts predict that climate change could cause the extinction of polar bears by the end of the century, governments have failed to protect these vulnerable animals from the added pressure of human greed. I hope it will do some good. We've asked them for decades to stop the seal hunt. Petition signed and personalized. It is time for all the hunters to find another outlet for their bloodlust, and trophy fixations. Letter sent. I will share this. Our records indicate that you have already taken action on this alert. Thanks! Thank you, Michelle for forwarding. Signed for sure! Thanks Simone and to Michelle for forwarding!! thank you michelle. it is bad enough that due to climate change(which we have humans to blame) our beautiful bears are dying out. if we don't act quickly, and save our planet, thousands of amazing animals will not survive. the rainforests are being demolished, habitats of our wild animals are being destroyed, and the pollution we are responsible for must not continue. NOW..... you greedy morons are murdering our polar bears for greed. we have to protect them from evil humans like you, and the government MUST enforce protection for them. I am so ashamed to be Canadian - especially with Harper's anti-environment in power. Treatment of polar bears is appalling. Signed and noted..thanks Simone..and Michelle for the forward! noted, signed, shared - thanks Simone ! Thanks Simone for sharing this. I personalized it, signed it, noted it and shared it. I then sent your a green star for to thank you for all you do for wildlife. Thanks Michelle and Simone - signed and noted. Gladly signed! Thank you so much Simone for postiing this! And thanks Michelle for sending ti ti me!!! Our records indicate that you have already taken action on this alert. Thanks! Thank you for posting Simone & Michelle for forwarding. So gladly signed again and again. Guess my other signatures signing this petition didn't take but gladly was able to sign again. Hope this one takes. Thank you Lisa N. for the forward. Done and dusted, Simone and Lisa. I pray it produces a positive result, although that this matter should be a bone of contention in the first place makes me less than confident. Very happily signed. Thanks Lisa N for forwarding this to me. Signed. Stop the killing of everything that moves. Thank you Simone - noted and signed. Done. Thank you Simone and Michelle for sending! proud of the fact. ugh! Signed, Thanks Simone, Lisa for the forward. Noted and signed. Thanks Simone. Whoever does not have compassion for another being, God will not have compassion for them!!! Noted and signed. Thank you for posting, Simone, and thank you for forwarding, Lisa and Michelle. Supernaturalist appeals to magical beings will not save these creatures. It is already too late. Even if all emissions were halted today, the pollutants already in the atmosphere will eliminate the arctic ice on which the polar bears have evolved to survive. All we can do is maintain the species in zoos and in DNA "doomsday" banks until, centuries from now, the environment recovers sufficiently to re-introduce them into the wild. The last place these beautiful beasts should be is locked up in prison(my name for a zoo) to be gawked at by all! I am sickened that there is a thirst to hunt or cage them. I so agree with Brian M.
Signed! Killing our sentient relatives, intruding upon their natural habitats, controlling their lives and deaths, is irredeemably uncool! Very poor choice, reverberates and resonates into many realms eternally. Revere and respect life and the rights to freedom and self-determination the CREATION has set in place. 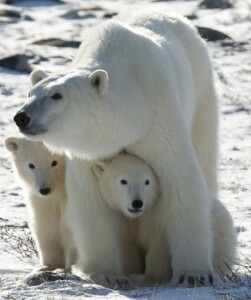 Thank you very much for helping to protect polar bears in Canada! Signed and noted. Hope this helps. Noted - signed and posted in group. Noted , signed & wrote letter , will forward and share. Thanks Simone for posting - and thanks to Lisa and Michelle for caring enough to forward ! I too am distressed at the number of Petions and News Article that seem to "Be forgotten about & not snet on for the designated purpose" ! It is a sad and disturbing occurance , that needs to change if we are to accomplish any goals ! Signed, No human just because we talk and walk, and have cars and make movies. Should not take advantage of being, that only has so very little and only wants to live life. We have homes they have to look for homes. We go out to eat or order out. And they have to look for food and sometimes not get it. We humans are selfish. And we take away a lot for those who don't have much. Noted & Signed. Thanks Simone. Noted with sadness in my heart for these beautiful animals to be saved from HUMANS before they vanish forever,i pray that with all the caring people doing all we can to save them it will make a difference,will forward to friends and family.Thank you dear Simone and michelle for the fwd. Have added to the letter with my utter disgust and sent it to the person responsible, utterly unacceptable. noted and signed -- the life of a polar bear is worth sooooo much more than a trophy hunter's ego/status/fame -- hunting polar bears or any other of mother nature's children is shameful! Signed - thank you Simone. Thank you, Simone. And thank you, Lisa N. for forwarding. Let's hope that America also takes steps to preserve the polar bears. Its noted and signed. Thank you Lisa. You cannot currently send a star to liz because you have done so within the last week. Noted, signed and posted in FB. and Twitter. Signed and shared in facebook. N7s..thanks Michelle for the fwd..
signed and noted thks. poor lovely animals. Noted and signed. Thanks Simone! I have already taken action, but thank you, all bears in Canada still need our help. Personalized letter sent and shared. Hard to believe that we don't protect the wildlife? I guess it is true "money is the root of all evil." noted, tweeted and shared.